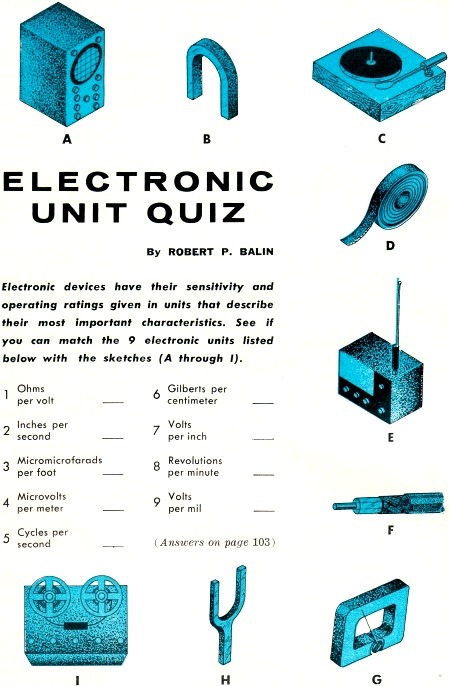 Back in the 1960s, Robert Balin created many quizzes on various electronics topics for Popular Electronics magazine. I have already posted a couple dozen of them. Here is the latest one on the subject of Units of Measure commonly found in electronics work. 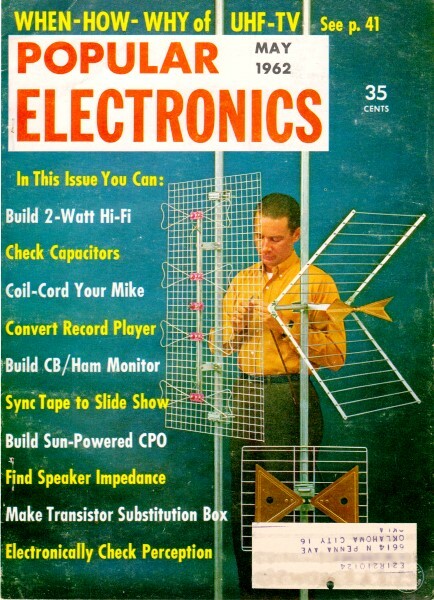 I missed the one for the tape deck, but then I don't ever remember concerning myself with the electrical and magnetic characteristics of tape decks. Electronic devices have their sensitivity and operating ratings given in units that describe their most important characteristics. See if you can match the 9 electronic units listed below with the sketches (A through I). 1 - (G) The deflection sensitivity of a basic meter movement is given in ohms per volt, which is the reciprocal of the current required to produce full scale deflection of the meter. 2 - (I) The speed at which the tape passes the recording and playback heads in a tape recorder is usually 7 1/2 or 3 3/4 inches per seconds (ips). 3 - (F) The conductor and metallic braid of a shielded cable form a capacitor, with the insulating material between them acting as the dielectric. When the µµf. per foot and the length of a cable are known, its total capacitive effect can be determined. 4 - (E) The strength of a received signal is measured in microvolts per meter - the dielectric stress existing between two points in the wave front 1 meter apart and lying on a line parallel to the electric lines of force. 5 - (H) The precise and stable frequency of vibration of a tuning fork given in cycles per second is often used as a reference frequency in electronic testing. 6 - (B) The amount of magnetizing force required to produce a magnet of a given strength is measured in gilberts, or ampere turns, per centimeter length of the magnetic circuit. One gilbert per centimeter is called an "oersted." 7 - (A) The deflection sensitivity of an oscilloscope is specified by giving the amount of input voltage required to produce a one inch peak-to-peak deflection on the cathode-ray tube screen. 8 - (C) Phonograph turntable speeds used today are 16 2/3, 33 1/3, 45, and 78 revolutions per minute. 9 - (D) The insulating ability of tape is given as the number of volts it can withstand per mil, or one-thousandth of an inch, of its thickness.